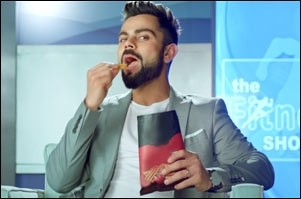 "RCB partnership to keep Virat Kohli off-limits for rivals": Anupam Bokey, Too Yumm! As RP-Sanjiv Goenka Group's Too Yumm! creates a AR-based mobile game to leverage the IPL buzz, we chat with the brand's marketing head, Anupam Bokey. A few days ago, Anupam Bokey, CMO, RPSG - FMCG, Too Yumm!, the snacks brand from RPS Goenka Group, was seen swinging a bat in front of a TV screen on a LinkedIn post. Soon after, we found ourselves swinging our phones in front of desktop screens. This was all because of the online cricket game - Karare Strikers - that doubles up as an AR-based (Augmented Reality) integrated campaign for Too Yumm! To start playing, users need to visit the Karare Strikers website on a PC and then calibrate the phone with the computer with the help of QR code and password. The phone then acts as a virtual cricket bat while the deliveries happen on the desktop screen. 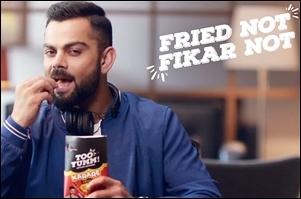 A month post its launch, in September 2017, the brand roped in Virat Kohli as its endorser and has been riding on its proposition of being a 'healthy', 'baked' alternative to fried snacks. This IPL season, the brand partnered with the Royal Challengers Bangalore (RCB) (Kohli is captain) as the team's 'snacking partner'. We spoke to Bokey about the campaign and his path towards making Too Yumm! stand out from among the other player in the salty snacks category. While the brand's efforts to make the most out of the cricket/IPL buzz is clear, it's latching on to a mobile game spiked our curiosity. "Integration happens at multiple levels and it may not always be straightforward. Here, it is about the idea of health/fitness around our USP - 'baked and not fried'. Our other assets (endorsers etc.) are aligned to this. Also, sports attract our TG of 15 to 30-year-olds," Bokey says. Karare Strikers was named after 'Karare', a sub-brand from the Too Yumm! line. While the brand's TVCs build awareness, its digital, social and activations create involvement. Speaking on digital integration's edge over traditional mediums, Bokey says, "TVCs provide information, but do not create engagement. You need to create something consumers willingly participate in. It has to be active where the brand is spoken about and with relevant placement." Too Yumm! assigns 75-80 per cent of its ad budget to TV for reach and building awareness. This is followed by digital and social for engagement. The brand also carries out its activations around popular events like food and music festivals, sports events etc. Apart from the high engagement over a short period of a 20-over IPL match, Too Yumm! eyes multiple opportunities to be seen. "Last year, we urged viewers to open a new pack with every wicket. This year we put out ad copies like 'Fried snacks out, Too Yumm! in,' as wickets fell," Bokey explains. With high engagement, a Kohli-Too Yumm! ad in a situation where the star and his team are not doing too well could invite negative consumer reaction. "There could be, but it is momentary and temporary. Kohli is a big star and he is well-disciplined, so a consumer's love for him doesn't change," Bokey opines. He reveals that while Kohli endorses Too Yumm!, the club (RCB) has its own methods of partnership. "We wanted to keep competitors at bay and not allow them access to Virat with our club partnership. Also, his being the captain of RCB, made it a good fit for us," Bokey mentions. Over the 24 years of his career, Bokey has had stints with Britannia and Hindustan Unilever (HUL). He has handled brands like Tiger Biscuits, Huggies, Dove, Clear shampoo, Pureit etc. in both global and Indian roles. Sharing his experience of starting Guiltfree Industries (Too Yumm! 's company) as a startup and borrowing experiences from his Unilever-Britannia past, Bokey says, "I had experienced almost 6-7 categories at Unilever over various continents and countries. I launched Britannia Tiger biscuits pretty early in my career (1998)." He went on to join Unilever when it was launching Huggies diapers (2000) which had a low penetration then. He then launched Dove Hair around a damage repair proposition, a first for the brand globally. Bokey also expanded the Clinic All Clear brand to South East Asia. "I then took the Pureit water purifier opportunity, a small brand, non-core to HUL. I launched it nationally and took it to 13 global markets with one innovation every quarter," he adds. He mentions that HUL, being a large organisation, seems mainstream and traditional, but the developments taking place in each pocket of the company is "unprecedented". "There are disruptions and path-breaking things happening at Unilever. I chose those assignments accordingly. Although there were very safe opportunities, it wasn't my style. Too Yumm! was similar. The ambition is to turn the RP-SG Group into a Rs 10,000 crore company in five years. This was also a better opportunity than what was available," Bokey outlines. The category of salty snacks is divided into Western and Ethnic snacks. In foods, apart from staples, biscuits come first, followed by salty snacks. In India, it's a Rs 23,000 crore category and within that, Western snacks (like Too Yumm!, Lays) make up for Rs 16,000-17,000 crores and is growing at over 15 per cent yearly. Elaborating on factors driving growth, Bokey highlights the growing consumer demand for branded/packaged products and a trend around health and wellness. He also says that in such a category, consumers are more open to experimenting with newer products. "It is a mass category and works like FMCG in terms of distribution etc. It's pretty much the same rules that I learned back at Unilever. Here too, the Rs 5 pack is contributing to 55 per cent of the market like the haircare category where Rs 1/2/3 sachets drive 70 per cent of the business. The scale at Unilever was much bigger. Unilever had multiple layers of decision-making, but the good thing is, here, you take the decisions," he explains. Counting Too Yumm! 's challenges, Bokey outlines the effort to keep the team 'agile' and 'action-oriented' as it swells. In his terms, while the brand enjoys high brand equity in the top eight metros, it is a challenge to expand distribution as he had to build it from scratch. "Some of our large competitors have the distribution network as their heritage asset," he says. He also maintains that beyond metros, the health proposition and the brand's sophistication may not be as relevant. "We launched Karare (similar to the Kur-Kure format) which consumers can relate to because of consuming a similar product for years. And the taste palate is relevant for the mass audience. We also launched a Rs 5 pack recently, keeping those markets in mind. It has been two months since the launch and Karare is already our biggest product. The breakthrough price-points for metros are still underway," Bokey explains with hopes to maintain the momentum. 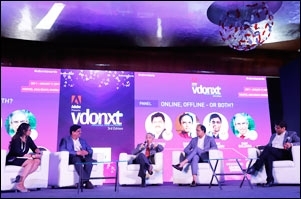 The brand is in an expansion mode and has changed its ad channels on TV from being metro-centric in the first year to GEC (General Entertainment Channels) in 2019.